For years, Smoker Friendly cigarette tobacco stores have been making smokers feel welcome. Now, the industry�s largest tobacco retailing chain is targeting premium cigar enthusiasts to make them feel equally at home as it undertakes a transition to become a full-line tobacconist. Smoker Friendly International, the Boulder, Colorado-based tobacco retailer that blazed its way to the top of the cigarette tobacco store (CTS) category during its 20-year history, fully recognizes the irony of its hometown intolerance for smoking. In 1996, Boulder became the first city in Colorado to ban smoking, yet the company continues to hold its annual outdoor trade conference there in late summer for its 575 affiliate and corporate-operated retail stores. Smoking is encouraged. When Colorado passed a comprehensive statewide smoking ban in 2006, the privately-held tobacco chain, owned by the Gallagher family along with founding partners Dave Bershof and Phil Harbison, saw an opportunity to further evolve its retail concept. With nearly all public venues declared smoke-free, in-store lounges were no longer an exotic amenity, but golden opportunity. The only current exemption is retail tobacco shops. �Initially the casinos were exempt,� notes Weiner, �but they lost their exemption. We�re obviously following that very closely to try to make sure we don�t loose this little niche.� Nationwide, the majority of states with smoking bans exempt retail stores whose primary business is tobacco merchandise. �That�s what really started to drive the whole idea of putting in areas to smoke,� explains Dan Gallagher, vice president of operations. �It started out with a couple of chairs so people could sit down inside because we�re exempt from the ban, being a tobacco store.� The concept was immediately successful, and grew into more formal lounge areas. When one of Smoker Friendly�s 98 corporate-operated retail stores had an opportunity to expand two years ago, the company embraced the growing premium cigar business and rethought the entire layout of the enlarged store. By developing a more sophisticated environment for its premium cigar clientele - while focusing a second lounge for cigarette consumers - the company was able to personalize its �smoker friendly� mantra to two very different audiences and customer bases. The store in question, known officially as Smoker Friendly #132 in the Denver, Colorado suburb of Thornton (itself the sixth most populous city in the state) became a blueprint for future Smoker Friendly store lounges. But it also embraced the company�s evolving success in the premium cigar category, which was not part of the company�s original business vision 20 years ago. The Thornton store, which opened in 1998, was one of the company�s typical setups - a relatively long and narrow 1200 sq. ft. shop located in an in-line shopping center. 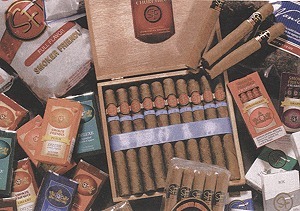 Around 2003, the store began to see an uptick in premium cigar sales. �We put in a real small walk-in humidor, and the premium side just really took off,� says Gallagher. �The manager we have there really embraced it, and got excited about it. A cigar store across the street closed right about that time, so we also started getting a lot of those customers.� For the next several years, the store continued to build this new category. 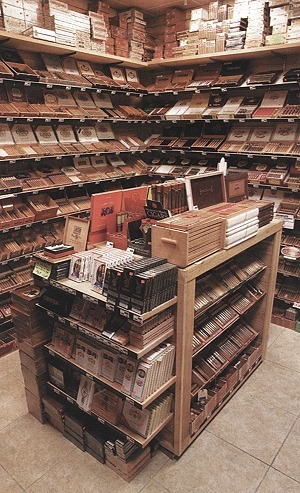 After the store was expanded and reconfigured, the walk-in humidor became a spacious 15 ft. x 16 ft. magnet for cigar enthusiast, offering a wide selection of premium cigars. Then, in 2007, an identically-sized adjacent space became available, and Smoker Friendly made a deal to double the size of the store to 2400 sq. ft.
�Essentially what we did is come up with a whole new concept,� says Gallagher, who oversees Smoker Friendly�s 98 corporate-operated stores. 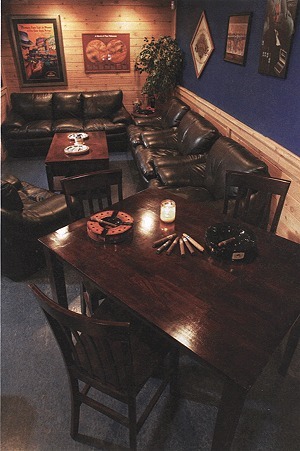 �Our earlier lounges were one or two chairs in a store, or maybe taking a back room and creating a small lounge.� For the enlarged Thornton store, they took a whole new approach, creating a significantly bigger walk-in humidor that measures 16 x 15 feet, created two separate lounges: the back lounge is premium cigar and pipe lounge, while the front-of-store lounge is �a little more eclectic looking, it�s more driven to the younger crowd with hookahs, cigarettes, and MYO/RYO,� says Gallagher. Flat panel TVs were added in both lounges, as well as a coffee bar. �It�s definitely a step up from what we were doing before,� says Jeremy Weiner, Smoker Friendly�s sales and marketing manager. Not only are the two lounges clearly defined with distinctly different personalities, but are located on opposite ends of the store, separated by the walk-in humidor. The cigarette/hookah lounge is up in the front of the store, with a bright look, while the premium lounge is tucked in the back, �real private,� says Gallagher, and characterized by a higher-end look - dark leather couches, club-like furniture - yet avoiding a clich� look. 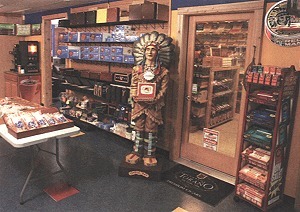 The Thornton store, which is open seven days a week, also conducts RYO/MYO tastings, where the store manager teaches customers how to roll their own cigarettes, and has even focused on a specific super premium cigarette brand, much like a cigar event: In July, the store held a Marshall McGearty night for Santa Fe Natural Tobacco Company�s new specialty blend boutique line. �People really enjoy those cigarettes,� Weiner notes, but being a brand new concept launched amid severe cigarette marketing restrictions, it�s a challenge getting the word out. In-store marketing is an ideal venue for familiarizing smokers with brand. As a full-line tobacco shop, this Smoker Friendly store has moved well beyond just cigarettes to include a full range of OTP, tobacco accessories, and premium cigars. The company has already made a few adjustments to the expanded Thornton store, carving out a second, smaller cigar humidor from a redundant hallway area between the two lounges. While exact logistics are still being worked out, the humidor will be dedicated to unbranded premium cigars from a single major cigar maker who will provide 25-count factory bundles of well-aged cigars which never made it to market - not seconds in quality. They�ll be wrapped in paper just like bundles are stored at the factories. The producer is even supplying factory trays for storage, and scrap tobacco leaves for the floor for ambiance and aroma. The shop will have the exclusive on the cigars in the Denver area. �We�ll open it up probably once a month or so,� explains Weiner. �We can do pre-sales of the cigars that people haven�t tried, then also have one day where we�ll open it up and sell these cigars.� The hope is create some excitement among the shop�s cigar consumers as they anticipate what new blend may arrive in any given month. Having specifically embraced cigar smokers, the Thornton store�s gross sales in premium cigars is higher than typical Smoker Friendly shops, at about 15�20 percent says Gallagher, and about 65�70 percent in cigarettes and the remainder in OTP and general merchandise. Cigarette Store Corp., also owned and managed by the Gallagher family, is the largest operator of Smoker Friendly stores. �We�re operating SFI and the Cigarette Store Corp. together,� Gallagher explains. The heart of the Smoker Friendly program is a sophisticated portfolio of private label tobacco products produced by major manufactures that even smaller stores can capitalize upon. Smoker Friendly International owns all the rights to the Smoker Friendly private label tobacco brands and products and works under a licensing agreement with authorized dealers, licensing retailers the right to use the Smoker Friendly name and the right to sell all company�s family of products through its authorized program. �Essentially there�s no licensing fees or store setup fees,� says Gallagher. �The only cost to a retailer of joining the program is to bring in the Smoker Friendly products, and their opening order of all those products,� and a $500 in-store sign package, which includes a neon window sign, door decals, pricing board, floor mats, and cigarette pricer. �Whether it�s a big one, like McClain, or a small local one, when they sign up as an authorized dealer, we�re happy to move that product through that distributor of their choice,� says Gallagher. The product lines are extensive - four styles and 13 SKUs of cigarettes; four styles and eight SKUs of RYO/MYO tobacco; six SKUs of little cigars; three SKUs of cigarillos; over 13 SKUs of premium cigars; six flavors and 12 SKUs of pipe tobaccos. �This event gives Smoker Friendly retailers a chance to network, listen to industry leaders, and share their insights on the future of the industry during panel discussions� explains Mary Szarmach, Smoker Friendly�s vice president of trade marketing. Panelists include principals from major tobacco manufacturers and trade associations, while a mini trade fair offers retailers and opportunities for exclusive buying opportunities. �We don�t necessarily buy as a group,� says Gallagher, �however I think through our relationships with all those manufacturers, they bring very strong deals, that there�s definitely a benefit in how retailers can buy once they become part of the Smoker Friendly group.� Last year, the festival/conference drew about 350 attendees, in addition to about 80 tobacco manufacturers. Another aspect of the Smoker Friendly authorized dealer program is territory protection. That said, the company is getting ready to launch its second combination Smoker Friendly / liquor store, in Nebraska. �That one�s going to have a walk-in humidor and a tasting room where we�ll be able to do tobacco tastings and also wine and liquor tastings,� says Weiner. For a non-tobacco category, that one sounds like a winner.